Exponents are used to denote the repeated multiplication of a number by itself. 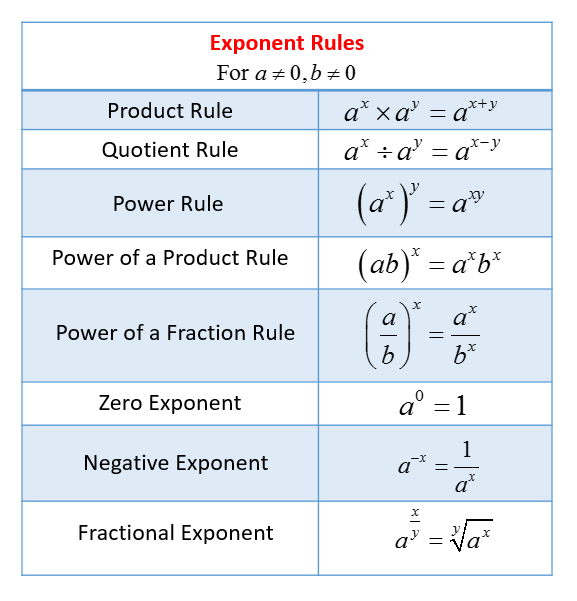 The following are some rules of exponents. Scroll down the page for more examples and solutions. When the exponent is 2, we call the process squaring. 52 = 25, is read as "5 squared is 25". 62 = 36, is read as "6 squared is 36". When negative numbers are raised to powers, the result may be positive or negative. A negative number raised to an even power is always positive, and a negative number raised to an odd power is always negative. Exponents can also be negative or zero; such exponents are defined as follows. • For all nonzero numbers a, a0 = 1. • The expression 00 is undefined. How to work with zero and negative exponents? A square root of a nonnegative number n is a number r such that r2 = n.
For example, 5 is a square root of 25 because 52 = 25. Another square root of 25 is −5 because (−5)2 is also equals to 25. The symbol used for square root is . (The symbol is also called the radical sign). The only square root of 0 is 0. Square roots of negative numbers are not defined in the real number system. Some numbers are called perfect squares. It is important we can recognize perfect square when working with square roots. How to use the rules regarding operations with square roots? A square root is a root of order 2. Higher-order roots of a positive number n are defined similarly. The cube root is a root of order 3. 8 has one cube root. The cube root of 8 is 2 because 23 = 8. The fourth root is a root of order 4. 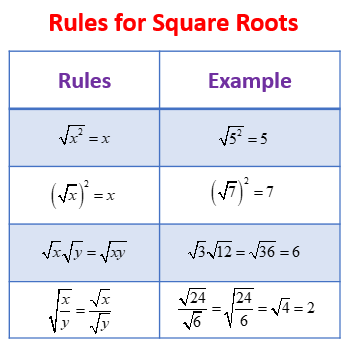 These nth roots obey rules similar to the square root. • For odd-order roots, there is exactly one root for every number n, even when n is negative. For example, the cube root of 8 is 2 and the cube root of −8 is −2. • For even-order roots, there are exactly two roots for every positive number n and no roots for any negative number n. For example, the fourth root of 16 is 2 and −2 and there is no fourth root for −16. What are radicals and how to simplify perfect square, cube, and nth roots?